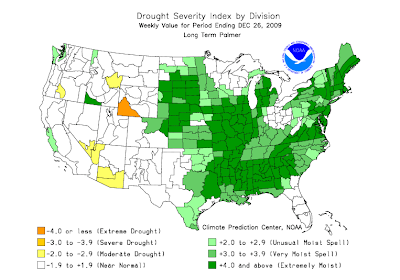 Here is NOAA's updated Palmer Drought Index which includes most of the precipitation from the Christmas storm. See post below regarding spring flooding potential. Click to enlarge. One word: Wow. I don't recall ever seeing this much green in winter. I'll continue to keep an eye on the spring flooding potential. UPDATE: Wettest two years ever for Missouri.